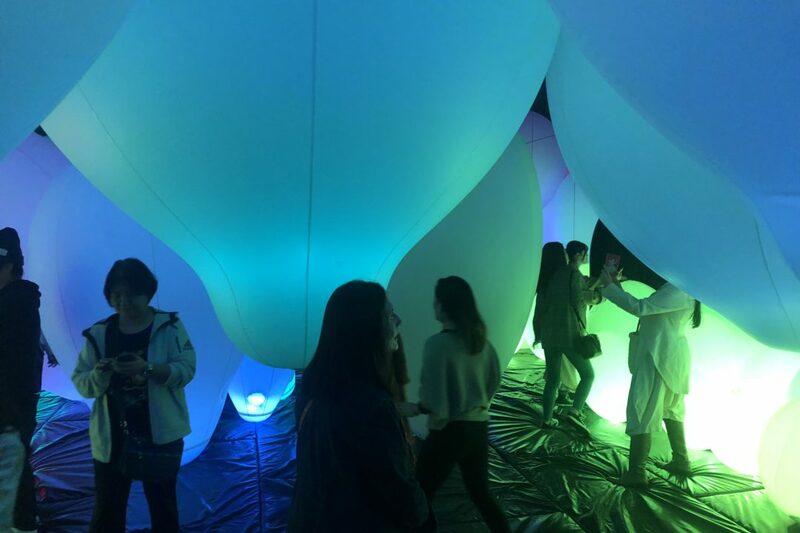 teamLab is an art collective, interdisciplinary group of ultra technologists whose collaborative practice seeks to navigate the confluence of art, science, technology, design and the natural world. Various specialists such as artists, programmers, engineers, CG animators, mathematicians and architects form teamLab. 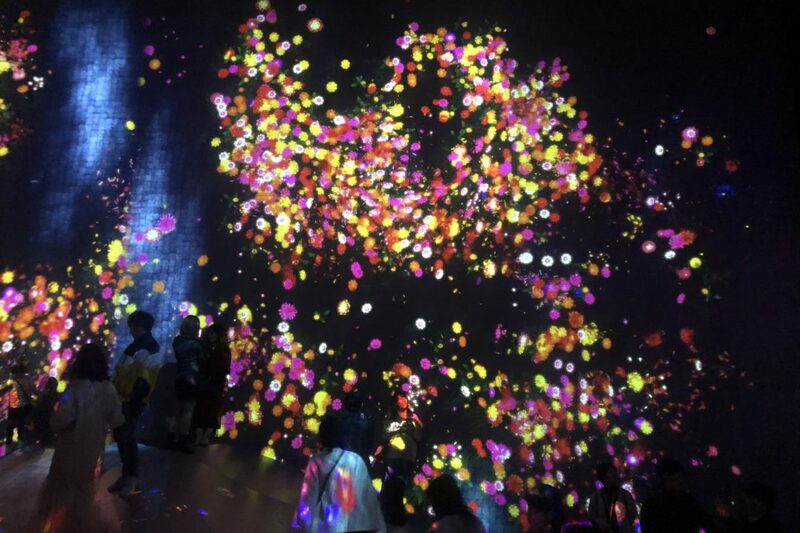 teamLab aims to explore a new relationship between humans and nature, and between oneself and the world through art. Digital technology has allowed art to liberate itself from the physical and transcend boundaries. 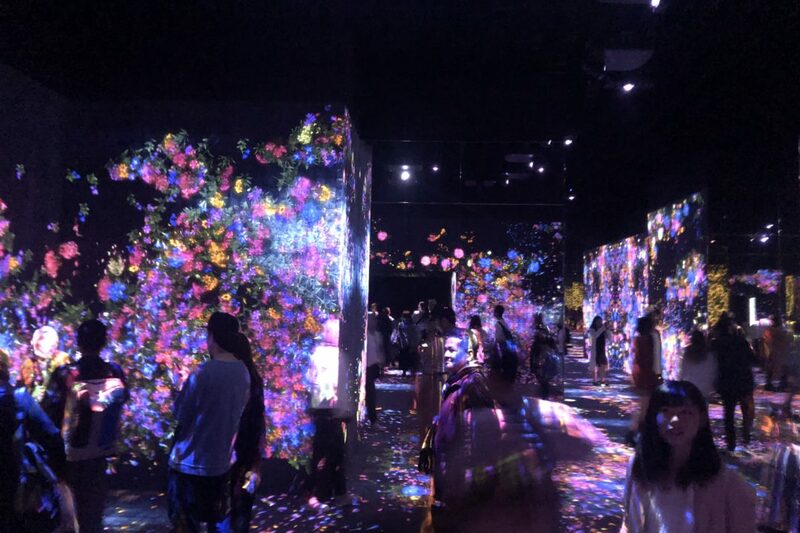 teamLab sees no boundary between humans and nature, and between oneself and the world; one is in the other and the other in one. Everything exists in a long, fragile yet miraculous, borderless continuity of life. 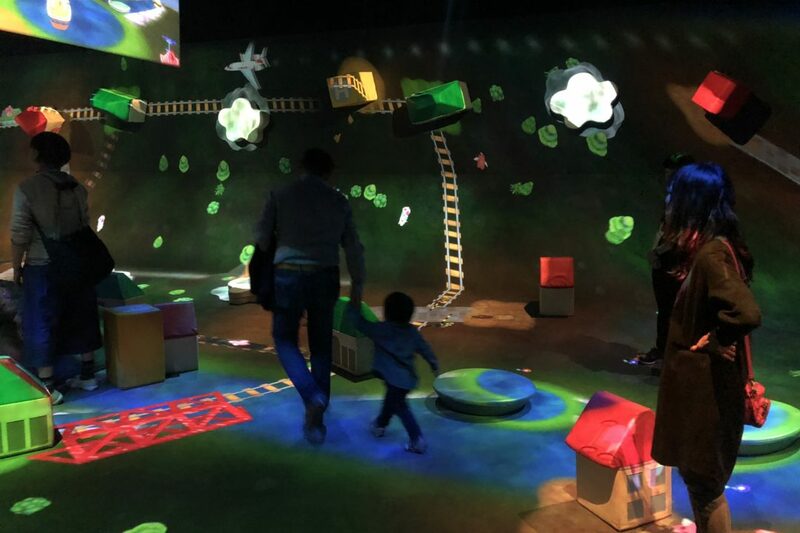 Visitors will be able to experience a digital museum built by professionals in a variety of industries that have collaborated to create immersive art using technology as their paint and brush. Visit extraordinary exhibits that reacts to the users interaction. Enjoy being amazed at how walls move and spring to life using a variety of styles and unique mechanisms. 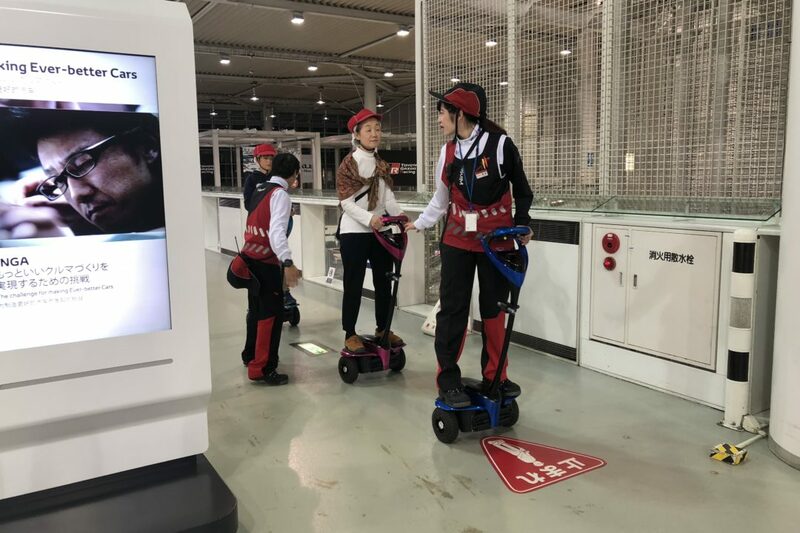 Visitors can purchase tickets through the official website or from a ticket machine that you’ll find at a Lawson or inside the magical 7/11’s that are found all around Japan. The latter will require you to either read Japanese or find help from an employee to assist you in purchasing them. Tickets can be sold out already on the day of and it’s highly recommended to reserve in advance. 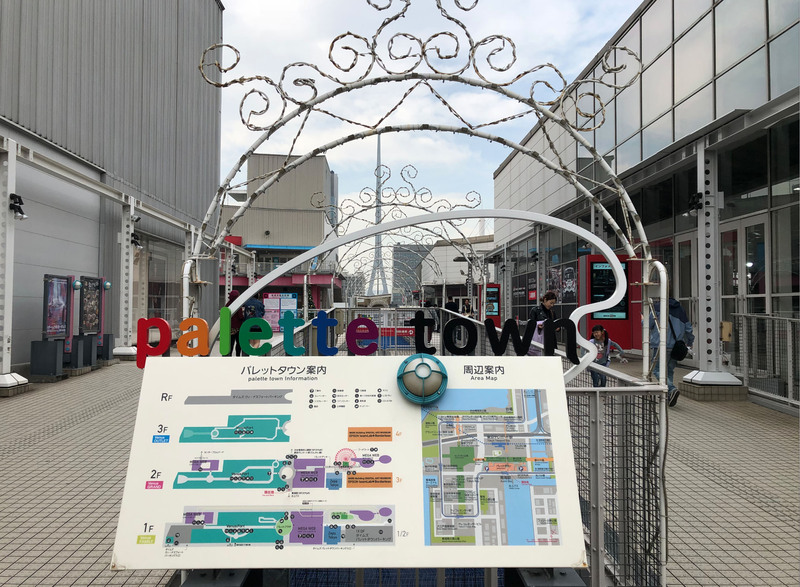 Once you have purchased the tickets head on over to Palette Town in Odaiba, Tokyo, one of the newest areas constructed in Japan. 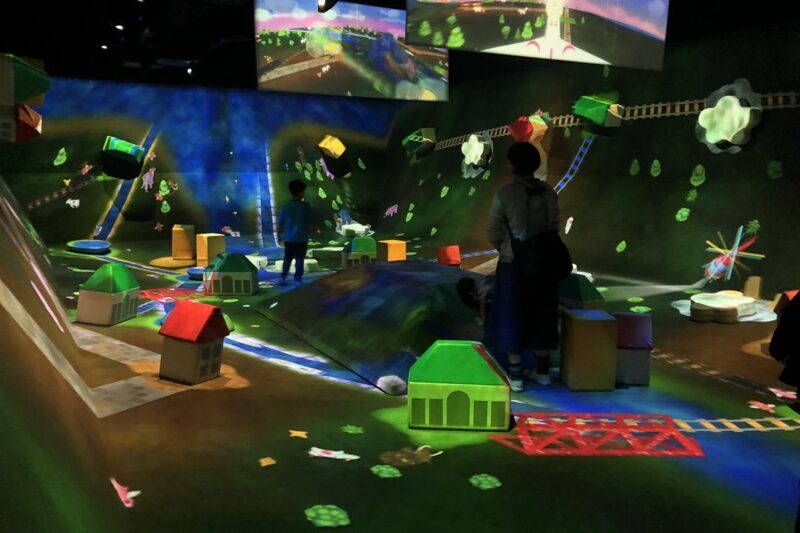 It’s a massive complex with a built in shopping mall, a ferris wheel, go karts, a convention center for technology showcases and an area designed for teamLab’s Borderless. The moment you arrive you’ll undoubtedly notice a long line that stretches far beyond the main entrance. You’ll have to spend around 30 minutes or so before being allowed to enter the building. With your ticket 🎟 in hand you’ll be permitted inside the main lobby. You’re able to rent out a locker if you decide to leave your personal belongings. Continue along to the main line where you’ll be instructed on how to properly approach the art work you’ll soon be experiencing. 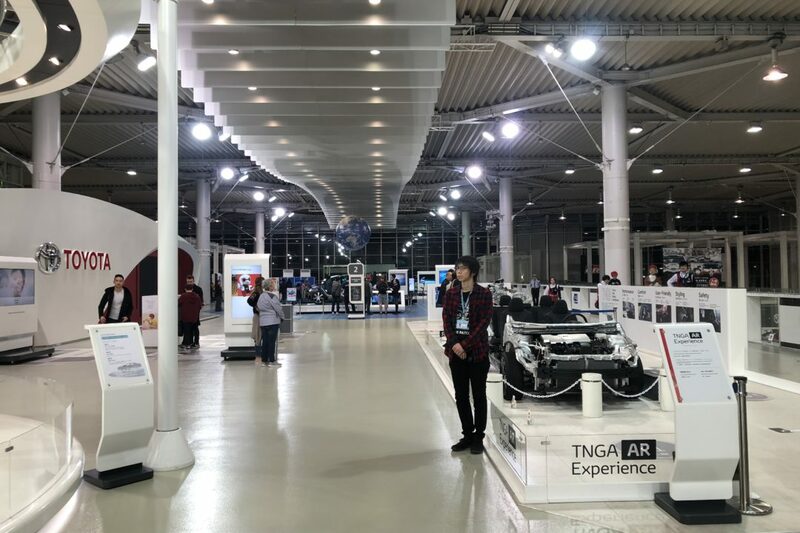 There are hidden access ways to view the exhibits from different angles. You’re encouraged to discover them. Signs on the walls display routes and information to different exhibits as you begin to enter. Sign signal asks if you’d like to go one way or another. There is no correct or wrong routes as you’ll experience all of them at different moments. There is no limit to how long you can stay inside. So take your time to enjoy all the exhibits because once you leave the premises will not be permitted to go back inside. The following are just a few of the exhibits you’ll be able to discover. If you decided to turn left upon meeting your first fork in the road, you’ll end up in the an enchanted area filled with flowers and exotic animals that are displayed on the walls and over the clothes of the attendees. People wonder in awe as they notice the beauty of each petal that dances elegantly over the entire building. In separate rooms with the same art style and mesmerizing movement you can also find displays of butterflies, elephants, peacocks and tigers. 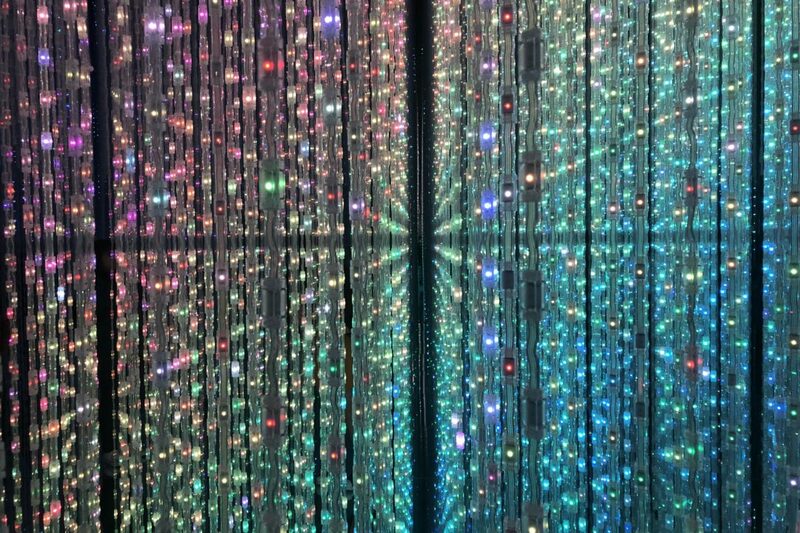 Probably one of the most visually enticing areas of the whole exhibit. 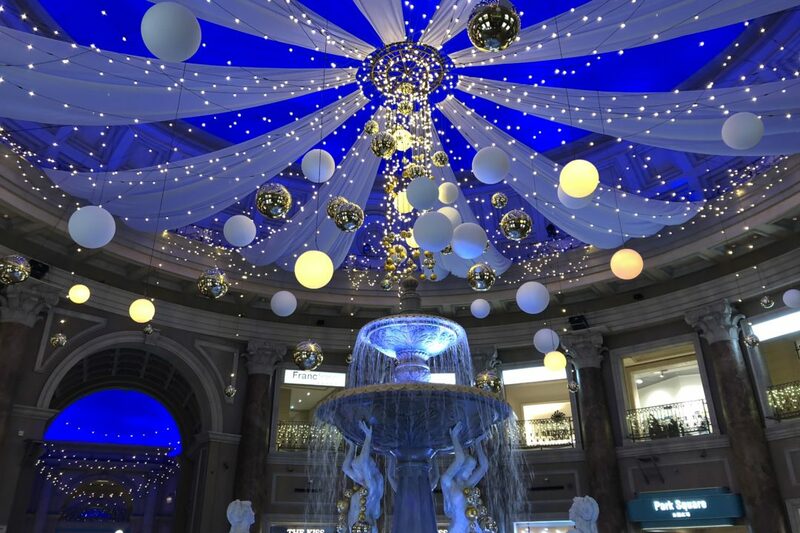 Thousands of strands of LED lights are connected together from the ceiling. They move according to a melodic soundtrack that is played in the background. 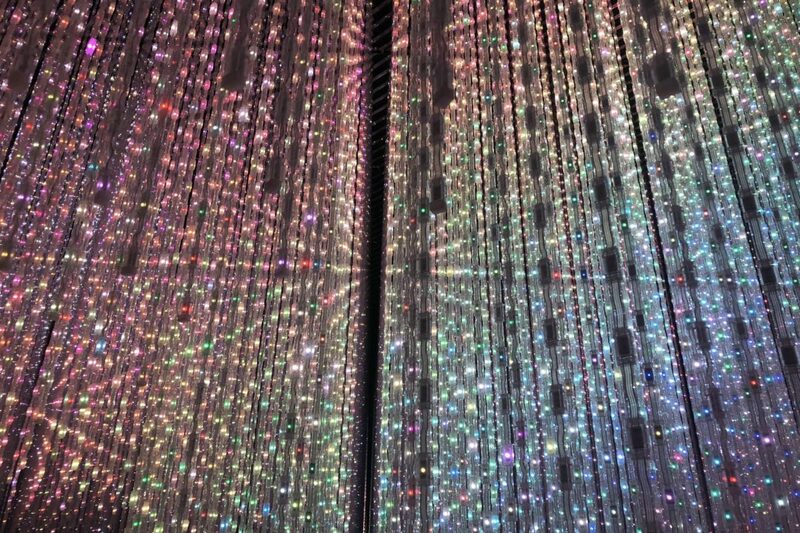 The lights are synced to the music. There is a podium where the LED’s can be controlled depending if the user changes the settings. 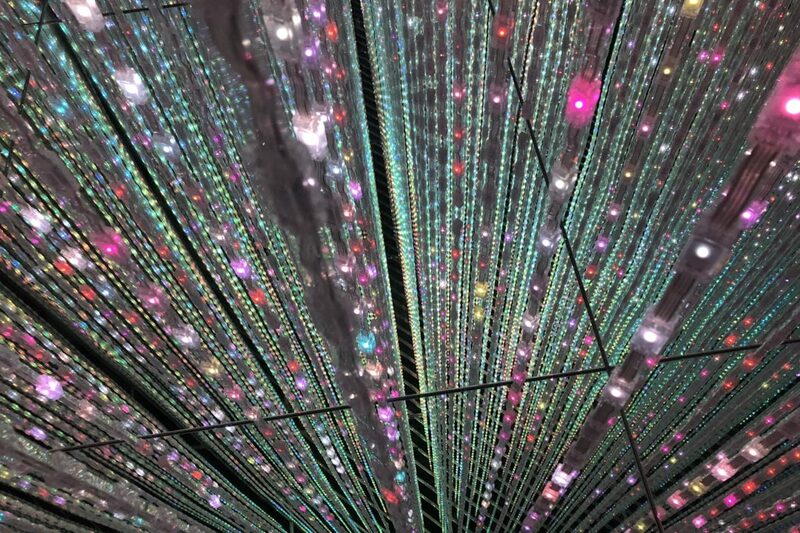 teamLab has gone far enough to develop an app which can be downloaded so users can take the experience through their phones to simulate the exhibit. Select how many will be attending and which function you’d like to watch. A number of different artworks enter this space from the passageway. This work will change when it touches your feet. It’s suggested to view the work from a position close to the entrance. 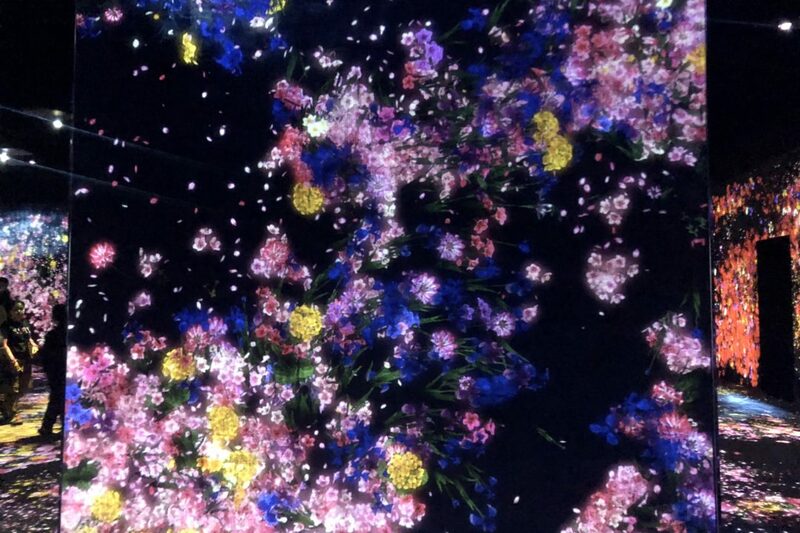 Birds fly through corners between the room exploding into flowers that appear as floating petals in a vast universe. In the background, an orchestral soundtrack is played along with the animation . 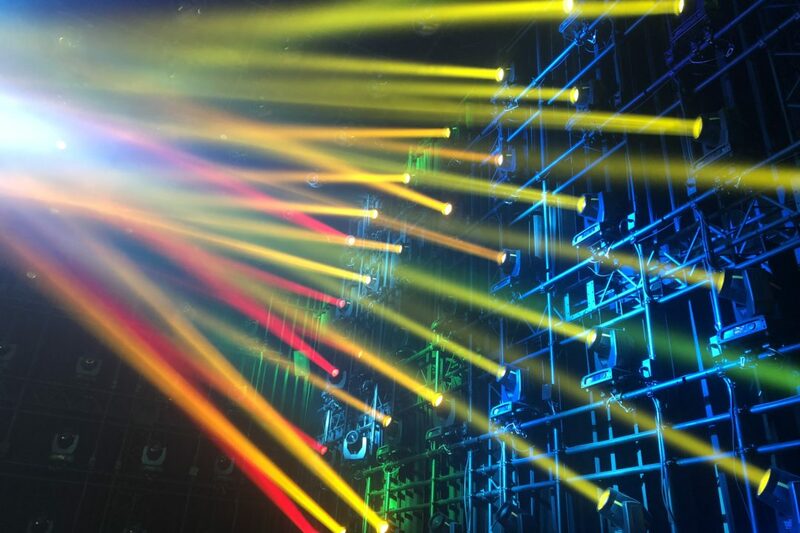 Some of the works will change when you touch the points where the light beams cross. 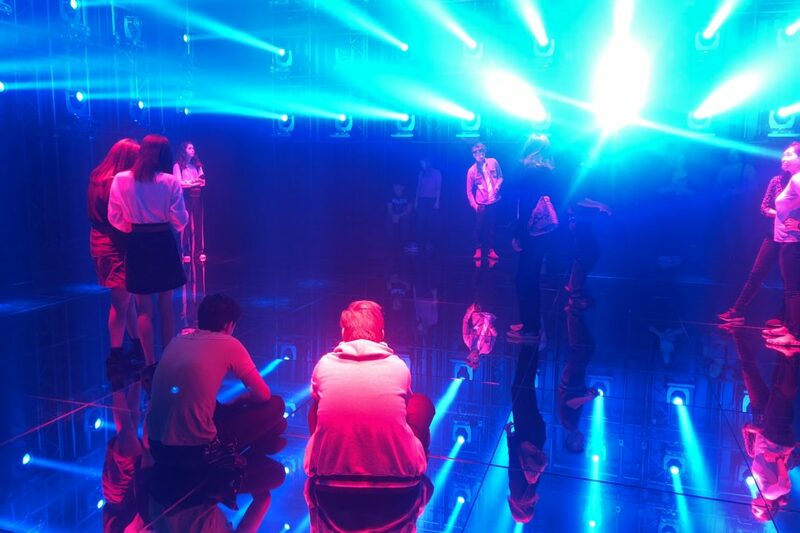 Stand in the middle of the room to experience the work. Women she be cautious as the floor if this work and others are mirrored. A way around skirt if available for free at the entrances of these types of exhibits. Once you’ve decided to leave Borderless, you’ll need to exit by navigating through dark corridors and the oncoming traffic of visitors bustling about. The route to the exit is full of stairs that continue to project artwork along the walls. Having reached the top of the stairs you’ll see a sign for a café that invites you for a cup of tea while continuing to enjoy art projected on tables and the walls. Walking along the path to the exit will only lead to another larger room called the Children’s Playground. A humongous spacious area dedicated for parents and their children to stimulate their creativity by playing on innovative jungle gyms, toys with unusual materials and a section for arts and crafts. It’s almost like they don’t want you to leave just yet. There is a separate area where children can illustrate and color while the walls illuminate the environment with colorful caricatures of sea animals. Parents and children both get to partake in activities together in elaborate obstacles courses or stimulating minds through solving puzzles. Since the moment your first step inside you’ll be astonished at how incredibly well-produced all the construction. With each foot forward taken, you’ll gaze in wonder as your mouth opens wide by saying “Wow!” everywhere your eyes lock on. 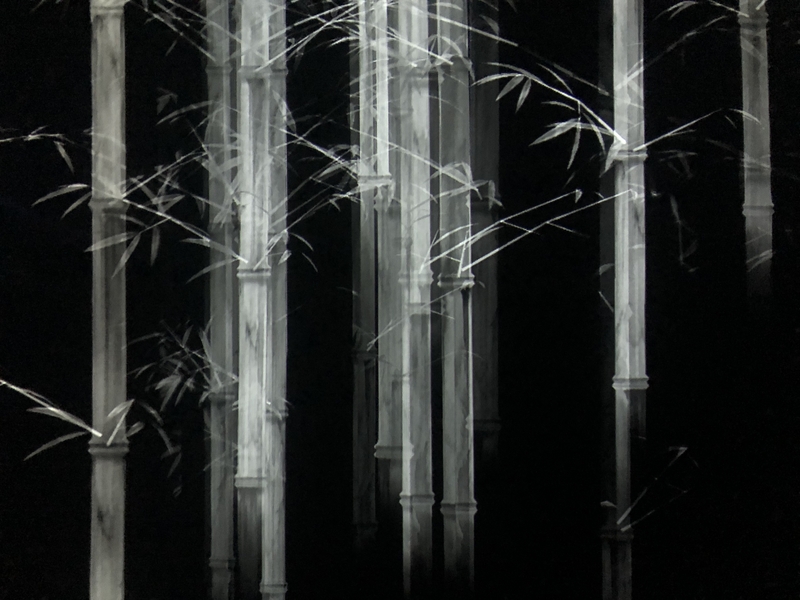 A large emphasis on nature and animals such as anthropomorphic frog merchants walking through a valley of bamboo carrying starts on one side of a hallway and continues onto the following corners leading over to the next wall in another room. It takes great lengths to have organized countless animations and programing user interactivity for the works on display. Color is vibrant and more than abundant lush forest, oceans and galaxies depicted with succulent detail. Conveniently located next the restrooms, lounges are available for visitors to sit down and rest their feet. Vending machines with drinks to help parched mouths are also in the same areas. 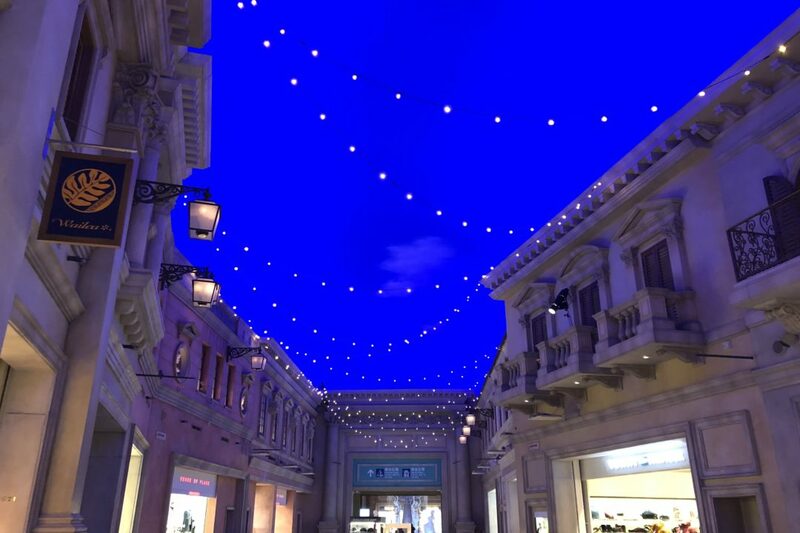 After visiting the most technologically advanced exhibitions in the world, take a tour around Palette Town. Take a breather at the local Starbucks, leave a pet at the salon, buy toys and clothes for children, or clothes for yourself. 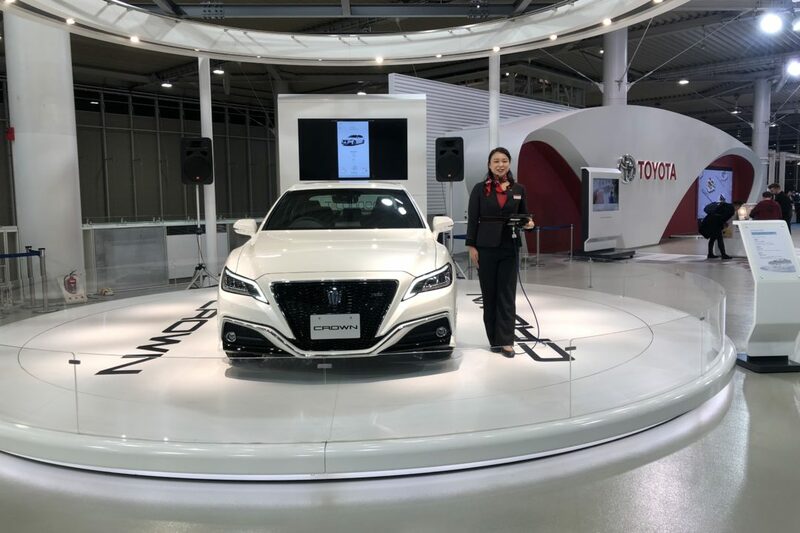 If you’re interested in seeing what Toyota has in development you’ll be able to view their products at the convention showcase. 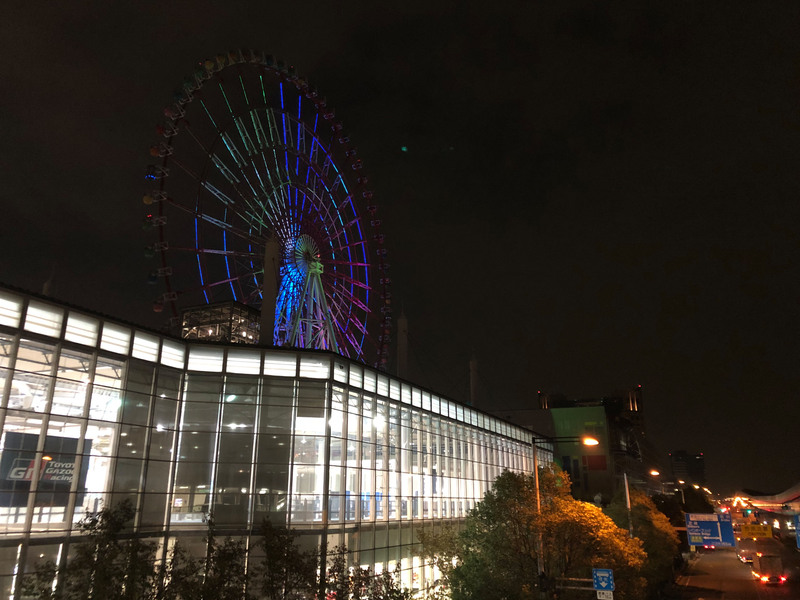 You can also ride Daikanransha, literally meaning “large ferris wheel”, next to the entrance of Borderless. 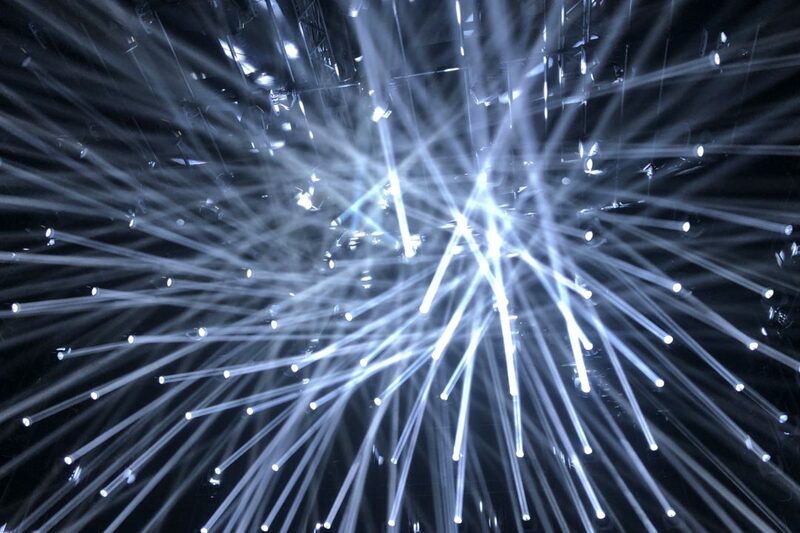 Borderless achieved one of the most innovative modern experiences to date utilizing new forms of media to transmit art into immersive environments. The sensations are hard to describe in words as you’re standing in front of rooms of elaborate works of art that vary in style from watercolor, simulated weather, infinity rooms, mirrors, LED lights, lasers, fog machines, projectors, variations of fabrics and so many more techniques that are used to showcase technology has no limit when producing imaginative, tangible works of art. Some exhibits may overshadow smaller, less creative displays but each is unique and offers a superb twist to how the user is able to experience and observe a digital museum. The entire place is completely safe and kept tidy. Bathrooms are found all around, the disabled have easy access to reaching every floor and wifi is free and abundant to help tourists in need. The trip to get there is worth it. You’ll be enjoying your whole afternoon at a wonderful museum experiencing art you can never find anywhere else. If you’re staying around Tokyo, this is one of the places we highly recommend visiting during your travels.